High Voltage Service helps prevent and solves electrical power problems through electrical engineering, electrical testing, preventative maintenance, repair, replacement, and power system analysis on either a routine or an emergency basis. Our mission is to provide the highest quality electrical power solutions while maintaining a focus and responsiveness to your electrical power needs. High Voltage Service has partnered with our customers, from Fortune 500 to utilities, to solve problems and we look forward to continued growth. High Voltage Service is a wholly owned subsidiary of DYMAX Holdings, LLC and our Test Technicians are members of IBEW (International Brotherhood of Electrical Workers) St. Paul local 110. Your satisfaction with High Voltage Service is 100% guaranteed. When you work with High Voltage Service, you will receive quality electrical service that is second to none. We strive to continually improve the long-term, trusting relationships we have developed with our customers. 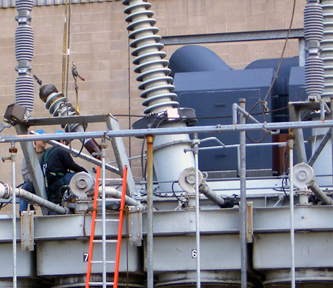 High Voltage Service offers a systematic and safe approach to electrical services. Our capabilities include transformer services, switchgear services, electrical equipment maintenance, electrical testing, repairs, replacement and circuit breaker remanufacturing. High Voltage Service can help prevent downtime by implementing a regular electrical system maintenance schedule. In emergency situations, High Voltage Service responds quickly to get your electrical power operations back up and running. To ensure safety and reliable results, our technicians follow a proven, step-by-step approach to electrical troubleshooting and preventative maintenance. Our NETA-certified Electrical Test Technicians are some the best-trained and most qualified professionals in the electrical power industry.